Yamaha took delight in whipping away the covers of their prized MotoGP machinery, riders and colours for 2019. A MotoGP icon, a young riding genius, a historic and innovative manufacturer: splash them all with that cool Monster Energy black-and-green and you have a race team ready to leave rivals covered in chunks of Michelin slick tyres. ‘Beast Mode On’ indeed. Excitable guests created a real buzz at the Four Seasons Hotel Jakarta as Yamaha took delight in whipping away the covers of their prized MotoGP machinery, riders and colours for 2019. The vibe wasn’t only about Valentino Rossi and Maverick Viñales together again for the third year in a row and the messages of resurgence and defiance from one of the FIM World Championship’s most successful squads and brands but also the dark new shade of the motorcycles that will stir emotions in fans across the globe in the next ten months. From caps on riders, drink bottles, products, the Monster claw on the sides of bikes since 2008, Valentino Rossi, and the ownerships of Grands Prix in Brno, Catalunya and Le Mans; Monster Energy has been a proud and proactive part of the MotoGP paddock. The company have now lifted their ‘left foot’ to shift that enthusiasm up a gear. The spotlight widened for the riders themselves. Rossi may celebrate his 40th birthday in a matter of days (February 16th) but the Italian maintains a youthful (and amazing) vigour for his profession/pastime. “It will be a completely fresh start for all of us: new title sponsor, new team colours, and for me a new rider number,” said new #12 Viñales who already gave cause for encouragement after particularly fast laps in 2019 testing towards the end of last year. “It all came together very nicely, so now all we have to do is get the preseason underway!” added the 24 year old. Monster Energy and Yamaha have been blasting lap-counters and expectations for a number of seasons and will continue to-do-so with this multi-year agreement. 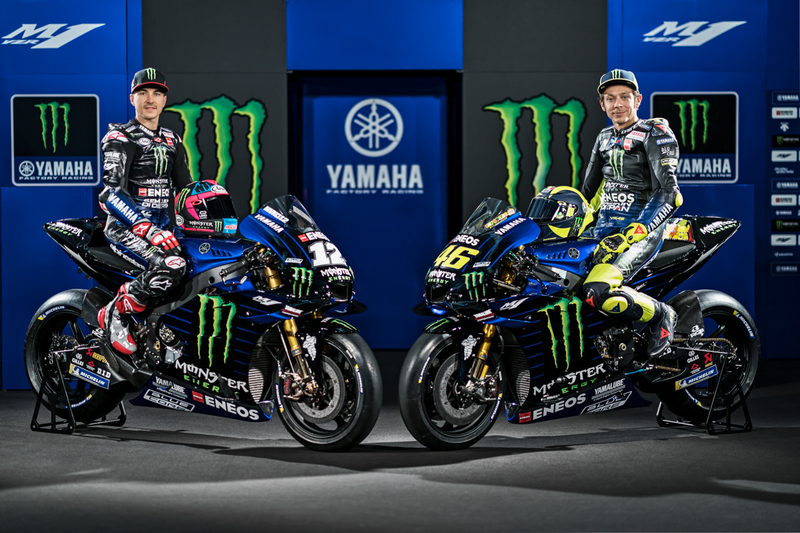 Rossi and Viñales might be hard to catch for their peers but that striking new livery means that fans worldwide won’t have trouble charting the ‘dark force’ set to blanket MotoGP.